Smartsheet is a software service application created by Smartsheet, Inc. which first launched in 2005 in Washington State. 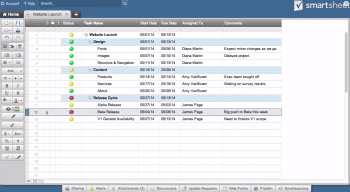 Smartsheet has a seemingly countless number of workplace applications. Smartsheet can be used to track marketing campaigns, create content marketing calendars, organize global events, manage budgets, track and report on projects, automate tasks and much more. Although Smartsheet offers an inexpensive individual plan, it’s main target is large corporations. The individual plan includes only a small taste of the features that Smartsheet has to offer (see chart below). Smartsheet’s focus is on accountability and transparency, and its platform makes it easy to share sheets, reports and budgets with stakeholders in real time. All of Smartsheet’s plans offer an unlimited number collaborators and use of their mobile application which seems to support their mission to encourage open, consistent communication. Smartsheet’s user interface has the familiar look of spreadsheets and calendars and yet is powerful enough to handle “a spider web of complex layers and intricate details” according to Kathleen Castaillic, the Senior Director at Global Events. Although Smartsheet is not the cheapest option, the quality of their product makes them a great value for those who can afford it. They also offer a generous free trial and a sizable discount for nonprofits which makes us like them even more. 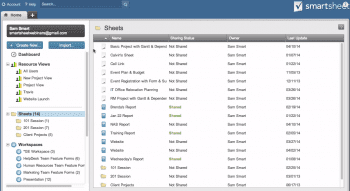 What Do You Think of Smartsheet?